A commercial cargo vessel is steadily closing in on the International Space Station, setting the stage for a historic rendezvous with the orbiting lab Sunday morning (Sept. 22). The unmanned Cygnus spacecraft, built by Virginia-based company Orbital Sciences, is expected to be grappled by astronauts using the space station's 57-foot-long (17.4 meters) robotic arm at 7:25 a.m. EDT (1125 GMT) Sunday. If all goes according to plan, the cargo ship will be secured to its docking port beginning at 9:15 a.m. EDT, NASA officials said. NASA officials described Wednesday's launch as "picture perfect," and the chase phase is apparently going smoothly as well. "All systems on the Cygnus spacecraft continue to operate very well, and the mission is proceeding just as planned," Orbital Sciences officials wrote in a status update Friday (Sept. 20). Cygnus has some work to do before arriving at the station, however, and it's not all about closing the distance gap. The spacecraft must also perform 10 maneuvers to prove that it can safely sidle up to the orbiting lab. As of Friday, Cygnus had completed two of those moves, with the other eight planned for early Sunday morning. "Once the final demonstration maneuver is deemed successful, NASA will give approval for the approach to within 10 meters of the station, where Cygnus will be grappled by the robotic arm and guided to its berthing port," Orbital officials wrote. 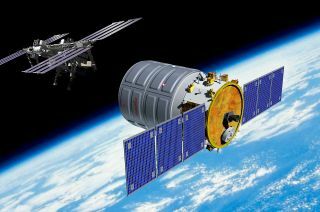 Cygnus won't be the first private shapeship to dock with the orbiting lab. The unmanned Dragon capsule, built by California-based firm SpaceX, has visited the station three times — first on a demonstration flight in May 2012, and then on contracted cargo runs in October 2012 and March 2013. SpaceX, which is led by billionaire entrepreneur Elon Musk, holds a $1.6 billion NASA deal to make at least 12 such flights.